For the hard of hearing, it can be incredibly difficult to hear things around the house. so it's vital that you have the tools you need to know what's going on in your home. A tabletop receiver for the Lisa alert system, the Lisa Alert System RX Table Flash Receiver utilises bright light and large icons to notify you of almost anything that happens in your home. When a transmitter is triggered the recevier's bright light will flash, providing an ideal notification solution for the hard of hearing who can her no alarm regardless of how loud and need a solid visual indication of what has happened. And because it's a tabletop solution, it's ideal for users who are typically sedentary and most likely to be in one place. 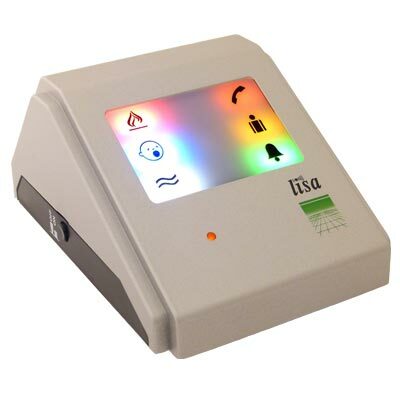 Each of the Lisa's events (Fire, Water, Baby, Telephone, Person call and Doorbell) has its own icon on the receiver with its own coloured light, enabling you to know exactly what needs your attention at a moment's look. The Lisa alert system is fully extendable, enabling you to add different Lisa transmitters to create the perfect alert system for your needs. The receiver also features a 3.5mm socket for additional alerts. Please click here to see the full Lisa range. Please note: this listing is for the Lisa receiver only and does not include any of the necessary transmitters.